Indicate languages spoken, including American Sign Language; and please indicate how fluent you are in this language (Enough to get by, fluent, native speaker and english is your second language, et cetera). Indicate days and times that we can contact you to discuss service opportunities. Please indicate if we should call you at your day number or your cell number during the day if that is convenient. Check as many as you desire from the list below. 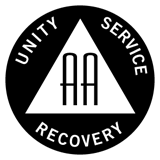 These service opportunities require a minimum of one year of continuous sobriety, with the exception of Central Office Crew which has no sobriety requirment. If you indicated above that you would like to be a temporary sponsor, please indicate days and times you are available. "Anytime" means 24 hours a day. If you indicated above that you would like to be a speaker, please indicate days and times you are available to speak. "Anytime" means 24 hours a day. If you desire to send this information electronically, then click the submit button to eMail this information to Intergroup. eMailing this information is not a secure transaction. If you are concerned about security, please print this form and mail, fax or hand-carry the information to the office instead of using eMail.